The Tennessee Immigrant and Refugee Rights Coalition is promoting the Coalition for Comprehensive Immigration Reform's designatation of May 1-3 as "Nationwide Call-in Days". The CCIR announcement is below. "...consider crime, which we abhor. We recognize the benefits to society of plea bargains, probations, parole, and time off for good behavior. The concept of a statute of limitations, which limits the amount of time the government can punish a crime, contains this American value of balance. 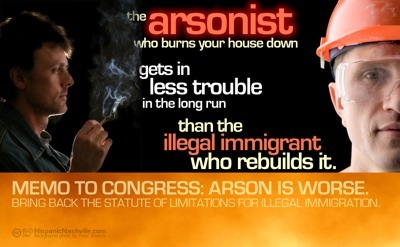 But currently, there is no statute of limitations for immigration violations - an arsonist can get in less trouble after a decade than a family of illegal immigrants*! Immigration law is clearly out of balance with our American values in our other laws - the ones that apply to us." "The problem with the  Senate bill isn't that it provides legal status to immigrants; it's that the legal status is a one-shot grant of legal status, not a systemic change. This makes it similar to the 1986 law. What we need instead is a systemic change to provide reasonably accessible methods to immigrate legally and also to convert to legal status after illegal immigration." So call in to Congress today and tomorrow during the "Nationwide Call-in Days," but don't just hit the normal talking points. Let's start discussing the return of the statute of limitations for illegal immigration. Call your Senators and urge them to move quickly to get real comprehensive immigration reform now. The country needs action! Call between 9:00am and 5:00pm Eastern time to have a better chance of connecting with the Senate offices. 1) The system will scan your phone number (or ask you to enter it) to verify your Senators. 2) The system will ask which Senator you would like to be connected to. 3) Before connecting, you will hear a brief message about immigration reform to deliver. 4) After the message, you will be connected to your Senator. 5) After you are done, be sure to call again and connect to your other Senator's office. ACT NOW IN FAVOR OF COMPREHENSIVE IMMIGRATION REFORM! Together we can make it happen - thank you for your efforts! *"Section 3295 of Title 18, United States Code, which was enacted on April 24, 1996, provides for a 10 year statute of limitations for certain non-capital arson..."